Folkestone Invicta manager Neil Cugley has said that playing Guernsey FC away on a Friday night could damage his side's play-off hopes. The Kent side go to Guernsey on Friday, 25 April but could have to repeat the trip three days later in the play-offs. The teams, currently third and fourth in the Isthmian South Division, were originally due to play the next day, but Guernsey's pitch was double-booked. Cugley told BBC Radio Guernsey: "It's just a mess, trying to play this game." 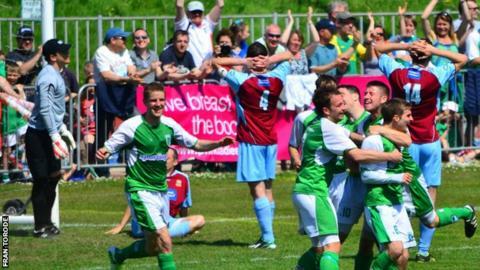 Depending on the teams' final league positions, Guernsey could host Folkestone in the play-offs on Tuesday, 29 April and Cugley is concerned about the prospect of two weekday trips in the space of just a few days. "I don't think the players are very pleased," he continued. "With a few of them being teachers, they wouldn't be able to get the Friday off [work] and then get off again for the Tuesday and Wednesday to play in the play-offs. "I think we would struggle to get a side out to play on the Tuesday. "Of course we're worried [about the impact on our play-off hopes]." Alan Turvey, president of the Ryman Football League, told BBC Sport: "Folkestone made the decision themselves. "They had the option to play the game on the mainland and it was their decision to travel to Guernsey." However, Cugley insisted: "We couldn't really play on the mainland because so many of our fans had booked trips for the weekend to see us play out there, so we had to bite the bullet and decide to play there on the Friday. "It's just been so complicated. They've got to come under the realms of everybody else of kicking off at three o'clock on the days of home and away games. "I'm only saying what other clubs are saying and what other managers are saying. I've had three or four managers phone me last week to say they're 100% behind me. "I believe they [Guernsey FC] should come into our league under the same rules as everybody else. "If we ask our league to move a fixture or kick-off time, we've got no chance. I've tried that in the past and they're not very helpful with that. They won't move kick-off times [for us]." The Channel Island side joined the Ryman League last summer after winning back-to-back promotions in the Combined Counties League. Turvey added: "Flights to Guernsey aren't all that frequent but the clubs in the league have co-operated fantastically. "It is important to remember that Guernsey have to pay to travel and accommodation costs of visiting clubs." In a statement, Guernsey FC said: "The change is due to the States of Guernsey-owned Footes Lane Stadium facility being booked for two events on that day. "It was deemed not possible to switch the fixture to Folkestone with the league ruling that the fixture must either be played on the Friday evening preceding, or on a neutral ground on the mainland on the Saturday. "Discussions are in progress to see if existing travel bookings made by Folkestone and GFC supporters can be changed or alternatively refunds can be made."